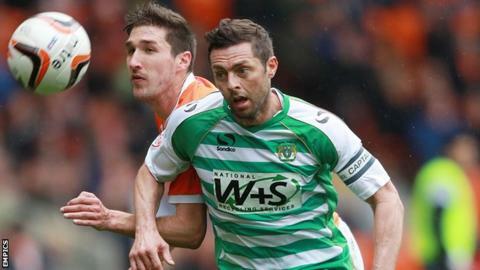 Yeovil Town have released veteran defender Jamie McAllister following their relegation from the Championship. The 36-year-old centre-back captained the Glovers to victory in the League One play-offs last year and made 40 appearances this term. Joey Jones, Ruben Palazuelos and Reuben Reid have also been let go. Meanwhile, goalkeeper Marek Stech, striker James Hayter, and defenders Byron Webster, Luke Ayling and Seth Nana Twumasi have been offered deals. Stech, who has received a call-up to the Czech Republic senior squad, is first-choice keeper at Huish Park and his understudy, Chris Dunn, is still in discussions over a new deal. Hayter, Webster and Ayling were all part of the promotion-winning squad in 2012-13 season. The Glovers have also confirmed Nathan Ralph will be given the chance to prove his fitness in pre-season. Commenting on the release of McAllister, manager Gary Johnson said: "Jamie has been a fantastic servant to me both here at Yeovil and at Bristol City. "He is 36 now and I think he still has a couple of good years ahead of him in somebody's first team.